Headed by the very experienced trainer of champions Grand Master V., this program focuses on teaching the basic fundamentals of Muay Thai. This includes stance, footwork, basic punches, kicks, knees and elbows and the defences to these techniques. 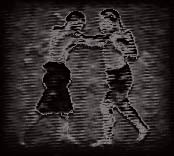 The name of Mae Mai Muay Thai describes the action when a Cambodian use an arm to prop a pillar. As Thailand has the history associated with Cambodia as well as people also has a very close relationship so we can see many of Mae Mai Muay Thai name use the term to describe people in neighborhood countries. Kamae Kham Sao This is the technique that boxer use to protect boxer from punch attack. The picture illustrates when attacker take punch attack, then the defensive bend down to escape form the punch, meanwhile use palm push o the attacker’s chin to respond. This technique only exists in Muay Boran training because in modern Muay Thai competition boxers have to wear gloves. However, this technique has been applied when boxer clinching, they can use palm push on opponent’s face or chin to escape from knee attack. The name of Mae Mai Muay Thai describes the action when a man put a flower one one’s ear. 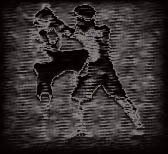 The name of this technique illustrate the action when defensive boxer respond by using elbow strike. Tad Mala This is the technique that boxer use to protect boxer from punch attack. The picture illustrates when the attacker take punch attack, then the defensive step beside to escape from the punch and use elbow strike to attack on the attacker’s neck. 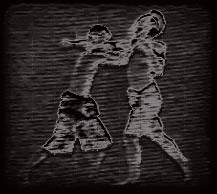 Even though, the name Tad Mala generally refer to the elbow strike to attack in the ear, but sometimes, as illustrated in the picture shows that elbow strike can be applied to attack other part such as neck. The name of Mae Mai Muay Thai describes the action when a man use a foot touching the enemy’s face. Bata Loop Pak This is the technique that boxer use to protect boxer from punch attack. The method of responsive attack is the same as Kwang Leaw Lang, which is using kick attack to respond to the punch attack but the figure is different. The picture illustrates when the attacker uses punch attack, the defensive uses the right arm to sweep the punch and respond attack by foot-thrust on the attacker’s face. 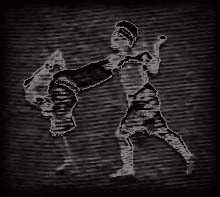 This technique is similar to Mon Yan Lak (มอญยันหลัก), which using foot-thrust to attack the enemy. The name of Mae Mai Muay Thai describes the action when a dear turn back. This technique compare to this action because deer has very strong horns and when it turns back quickly, horns will make any enemy around them get severe injuries. Kwang Leaw Lang This is the technique that boxer use to protect boxer from punch attack and response by reverse back kick. The picture illustrates when the attacker take a punch and the defensive step backward to avoid the punch, then the defensive use reverse back kick to respond to attacker. The kick of the defensive boxer illustrate the figure of deer’s horns to attack its enemy. Sukreeep = สุครีพ A magic monkey character in Ramayana story. The name of Mae Mai Muay Thai describes the action when a magic monkey pulling up a tree. As we usually see that most of the name of Mae Mai Muay Thai use character in Ramayana story. This because Thai people are really appreciated with Ramayana story. Sukreeep Thon Ton Rang is the technique that to protect from kick attack, in the same time respond by lift up the attacker’s leg to response in order to make the attacker loose the balance so the defensive have an opportunity to attack by other Mauy Thai techniques. 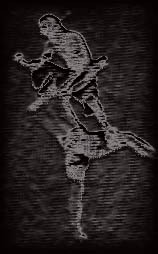 The picture illustrates when the attacker kick to the body and the defensive use the left arm to block and in the same time grab the attacker’s leg up high in order to make attacker lose balance. Today this technique has been used in professional Muay Thai but not exactly the same with this illustration. The technique normally called “Tai Na” (ไถนา) which the defensive boxer grab and carry the attacker’s leg push the attacker forward. Pra Jao Ta = The pronoun describe when students call their respected an old teacher but this word normally use in poetry and Thai mythical tale stories. The name of Mae Mai Muay Thai describes the action of when an old teacher sitting on a platform. Phra Jao Ta Nang Thaen This is the technique that boxer use to protect himself from kick attack. This technique is a fully defensive figure and there is no attack response to the attacker. 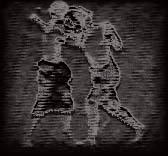 The picture illustrates when the attacker take lower kick and the defensive quickly bend down the knees and use bottom to block the kick attack. Even though this technique does not continue by a attack respond from the defensive boxer, but it is a good opportunity for the defensive to looking for chance to attack back by other Muay Thai techniques. This technique is rarely seen and it’s being taught in Muay Boran lesson. The name of Mae Mai Muay Thai describes the action when a man chop a knife on a fish head. Sab Hua Mat Cha is the technique that to avoid from punch attack. But difference is this technique respond to low punch and intend to attack head of opponent, because when the attacker use low punch attack he will lose protection of upper part of the body. The picture illustrates when the attacker punches to the body, then the defensive use the left hand to sweep the punch away and in the same time respond by use fist chopping on the attacker’s head. The name of Mae Mai Muay Thai describes the action of when a man cutting (slice) a gourd into piece. 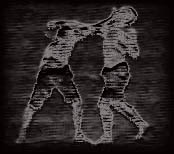 The action compare when a boxer use elbow strike to the opponent’s neck, like when he put a knife (elbow strike) to cut a gourd. Faan Look Buab is the technique is used to respond punch attack. The picture illustrates when the attacker (white) perform straight punch to the defensive. Then the defensive raise the left arm to protect the punch, in the same time one step forward to be close to the attacker and respond by downward elbow strike, target to the attacker’s neck. This technique is quite effective as the person who was attacked by elbow strike have least chance to escape and protect himself from the elbow. 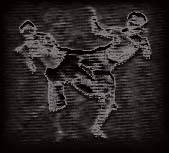 Then Kwad Lan is the technique that to avoid from kick attack, in the same time respond by sweeping kick to attack the lower part of the opponent’s leg. 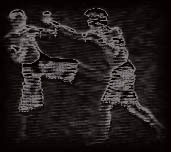 The picture illustrates when the attacker uses right kick attack, then the defensive bend over to escape form the kick and respond by sweeping kick at the attacker’s knee. This technique was used very often in professional Muay Thai competition and it is very effective as the defensive will gain advantage when the attacker collapses. 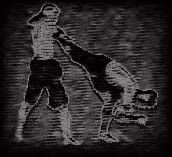 Some boxer also apply this technique, instead of bend over to escape from kick attack, they grab the attacker’s leg tightly and then respond by sweeping kick. The name of Mae Mai Muay Thai describes the action of when a mythical elephant swing up its ivory to attack. Compare to the action when boxer use upper-cut elbow strike to attack. Erawan Soei Nga is the technique is used to respond punch attack. The picture illustrates when the attacker perform straight punch to the defensive. Then the defensive raise the left arm to protect the punch, in the same time one step forward to be close to the attacker and respond by upper-cut elbow strike. We will not see this technique use in the professional Muay Thai competition (we usually see Sork Klab (reversed elbow strike). However, this technique is very effective for Muay Thai for martial arts. The name of Mae Mai Muay Thai describes the action when a man climb up the mountain, like the action in the picture illustrates the advanced technique to jump over the opponent and attack. Tai Khao Phra Sumaru This advanced technique needs intensive training and accuracy in terms of time and skills when using. The purpose of using this technique is to avoid from kick attack and respond by elbow strike. The picture illustrate when the attacker throws knee kick then the defensive jump over to step on the attacker’s thigh, the right leg step on the shoulder and perform elbow strike. Important: Even though this technique is still allowed in professional Muay Thai in Thailand, but it is not allowed in other country. This technique requires strong skills to perform, lack of training and misuse of this technique may harm both of boxers, please make sure that you trained with professional and experienced Kru. Mut Badan is the technique is used to respond punch attack, especially when the defensive turn the back side against the attacker. The picture illustrates when the attacker throw the punch from the back, then the defensive suddenly bend down to move avoiding the punch, in the same time respond by swing the leg to kick the attacker. 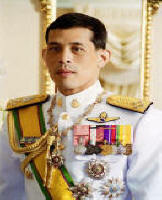 The name of Mae Mai Muay Thai describes the action when a magic money give the ring to its boss in the Ramayana story. The action describe as if the ring still attached to finger so this term is used when describe when boxer attack by a punch. 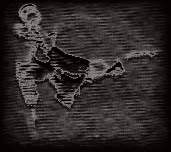 Hanuman Tawai Waen is the technique that use for respond punch attack. The picture illustrates when the attacker punches then the defensive uses the left hand sweep the punch, in the same time the defensive step forward and respond by punch to attacker’s chin. This technique seem very common approach like take punch but intend to attack vulnerable spot like chin so it will be come one of the deadly technique in Muay Thai. Mon Tho Nang Thean is one of Mae Mai Muay Thai that rarely seen because this technique requires advanced skills as well as special technique to perform. This Mae Mai Muay Thai used to respond kick attack. The picture illustrates when the attacker perform kick attack, then the defensive quickly jump over and sit on the attacker’s leg in the same time he responses by elbow strike to the attacker’s head. This technique is demonstrated in Muay Boran rather than regular Muay Thai competition. The name of Mae Mai Muay Thai describes the action when a man trying to break the elephant’s neck. Hak Kor Erawan is the technique that uses to protect boxer from the knee kick attack or clinching. This technique is rarely seen in modern muay Thai because it is very dangerous to do and it may kill the boxer. However, in Muay Boran lesson, this technique is very effective. The picture illustrates the attacker try to come close, then the defensive boxer use the right hand push the attacker’s chin and twist the neck. Note that this technique must me practice under supervision of professionals Kru of Muay Boran. The name of Mae Mai Muay Thai describes the action of when a demon trying to grab or lock a monkey. Khun Yak Chab Ling is the technique that uses to respond punch attack. The picture illustrates when the attacker try to punch at the defensive boxer’s face, then the defensive boxer uses the right hand to sweep that punch, in the same time lock the attacker and ready to respond by other type of attack. The terminology represent when the demon try to stop a monkey as monkeys are so quick and naughty so only way to stop them is to lock or grab them at the neck, this customs derived from the mythical story Ramayana. The name of Mae Mai Muay Thai describes the action when a man trying to close or shut down a lamp. This word is quite uncommon as Thai usually compare a man’s eyes as lamps as eyes enable people to see things just like a light of a lamp to make us see things at night. So to attack the eyes can be compare with to shut down his lamp. Dab Chawala is the technique that used for respond to a punch attack. The picture illustrates the attacker trying to take a straight punch, then the defensive boxer uses the left arm to sweep that punch, in the same time respond by a straight punch to the attacker’s eye. This is not a complicated technique but intend to attack a vulnerable targets such as eyes socket. The Mae Mai Muay Thai describes the action of when a bird quickly turn back to its nest, to compare the action when a boxer quickly take a reverse elbow to attack. The name of Mae Mai Muay Thai describes the action when a man trying to twist mythical snake’s tail. Bid Hang Naka is the technique that has similar objective to Hak Nguang Ai Yara. The different is Bid Hang Naka use to respond to foot thrust and intend to attack the attacker’s foot. Instead of pushing weight on the leg like Hak Nguang Aiyara, Bid Hang Naka allows defensive boxer to grab the attacker’s foot and suddenly twist the ankle to injure the attacker. This technique is quite danger so it is rarely be seen in modern Muay Thai competition. The name of Mae Mai Muay Thai describes the action of when a man trying to break an elephant’s trunk. 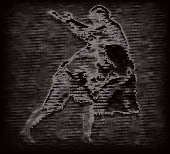 Hak Hnuang Ai Yara is the technique that use to respond kick attack. The picture illustrates when the attacker kicks, the defensive boxer then try to grab attacker’s leg firmly and use the right arm push on the leg to make attacker fall down. Defensive boxer may increase the injury to the attacker’s leg. The defensive boxer may apply the technique by using elbow to punch on the leg. The name of Mae Mai Muay Thai describes the action when a crocodile thrash its tail. Thais compare a reverse kick attack with the crocodile thrash its tail because thrashing tail of crocodile has a lot of power. Jarakhae Fad Hang is not a defensive technique. It is a technique that use a reverse kick to attack opponent, which usually follow after the first kick. We can still see modern Muay Thai boxers use this technique as it’s not require special skill to do. However, boxer should be careful of using it as after launch the reverse kick, the attacker may lose defensive position and can easily be attack if he missed the reverse kick. Look Toi = small wooden sticks that stab on a trunk for a man to be able to step on it to claim up the tree. The name of Mae Mai Muay Thai describes the action when a wooden stick is stabbed on a tree’s trunk, like the attack of defensive boxer stab elbow on the attacker’s leg. Pak Look Toi is a defensive technique itself but practically it is also one of the deadly Mae Mai Muay Thai attack. As you can see fro the picture illustrates the defensive boxer try to block the attacker's kick. At the same time, he also respond by using both of elbows to stab on the attacker’s leg. This is a destructive weapon that probably makes severe injury to the leg. The name of Mae Mai Muay Thai describes the action of Mon to take a foot thrust to a stake. Mon Yan Lak describe the action when the defensive boxer take a foot thrust in order to protect from attack, or not allow attacker to come too close. This technique is a fully defensive technique, no deadly attack respond to the attacker apart from the foot thrust for protection. However, the full power of the foot thrust probably strong enough to make the attacker fall down and the defensive may take the responsive attack. The picture illustrates the defensive boxer take the foot thrust to protect himself from the attacker’s punch. The name of Mae Mai Muay Thai describes the action of an old man to prop up a gourd. This action derives from the daily life style of Thai people in the old time. Ta Then Kham Fak is Mae Mai Muay Thai that used in order to respond to the punch attack. The picture illustrates when the attacker attack by punch and the defensive boxer diagonally step away from the punch as well as use the right hand to push the attacker’s punch. At the same time, the responsive attack has been made, the defensive boxer use left punch attack at the attacker’s chin, looks like the action when an old man props up a gourd. The name of Mae Mai Muay Thai describes the action of lifting the mythical mountain. The Kao Pra Su Meru is a mythical mountain, which Thais believe that it s very tough, so lifting this mountain so only a man who has great power can lift it. Yok Kao Pra Sumeru is the technique that to respond kicks by lifting the attacker’s leg and throw the attacker. 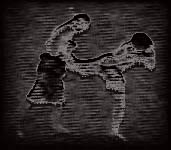 The picture illustrate the defensive boxer grab the attacker’s leg, lift and throw the attacker as the name of Mae Mai Muay Thai describe the action that to lift the mountain. The name of Mae Mai Muay Thai describes the action when an Indonesian stabs a dagger to opponent, this action also derives from the believe as same as Chawa Sad Hork. As same the approach of Chawa Sad Hork, E-now Taeng Krit is another defeisive technique that is used to respond to the punch attack. 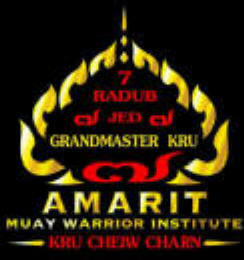 The only different between Chawa Sad Hork and E-now Taeng Krit is the method of attack to respond to the punch attack. E-now Taeng Krit uses knee kick to attack instead of using elbow. The picture illustrates the defensive boxer pushing away the punch as well as response by knee kick. 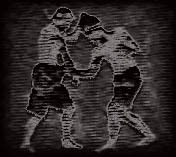 The name of Mae Mai Muay Thai describes the action when an Indonesian throws a lance to opponent, this action derives form the believe that in the old time Indonesian is expert in using lances. Chawa Sad Hork is also according to the theory, the defensive technique in order to let the defensive boxer avoid the attacker’s punch. But in terms of practical use, Chawa Sad Hork is the technique that effective for defensive and attack in the same time. 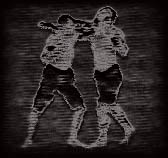 The figure illustrates the attacker ( wearing white head tape) trying to punch, then the defensive boxer to kneel a bit in order to escape form the punch and use the right hand to push away the punch and use elbow to attack. The elbow attack is compared to the action of when Indonesian throws a lacnce. The name of Mae Mai Muay Thai describes the action when a bird try to break into its nest. Paksa Weak Rang is also defensive Mae Mai Muay Thai. It can be used when the attacker try to grab the offensive’s neck in order to attack by knee kicks or clinching. The picture illustrates the attacker trying to grab the defensive’s neck to attack by knee kick. The defensive then use both arms to insert between the space of attackers arms in order to interfere his step, then the defensive suddenly attack by knee kick. This technique can also be applied to when attacker uses punch, the defensive can use the technique to push away the attacker’s punch then respond by other weapons. Salab Fan Pla is Mae Mai Muay Thai that use for defence. The figure illustrate the attacker use punch to the defensive and the defensive using Salab Fan Pla by step back obliquely to avoid the fist, then the defensive use hand grab or push the attacker’s fist away, in the mean time the defensive is considering to respond by other attack. This Mae Mai generally use to defence from punch mainly. The term Salab Fan Pla describes the figure when the defensive move/shuffle left or right foot one step back, which very much look like the shape of fish teeth, so we call theis Mae Mai Muay as Salab Fan Pla. The term Mai Muay Thai refers to the advanced techniques that used in combination of basic weapons and movements in order to attack or defence. All of Muay Thai weapons have their own Mai Muay Thai, which are fists, feet, knees and elbows. Mai Muay Thai of the basic Muay Thai weapons are generally called according to the name of weapon, for example Mai Mad refers to the advanced technique of using fists, Mai Tae refers to the advanced technique of using feet, Mai Theeb refers to the advanced technique of using foot thrust. Mai Sork refers to the advanced technique of using elbows etc. Look Mai Muay Thai tricks are derived from Mae Mai.